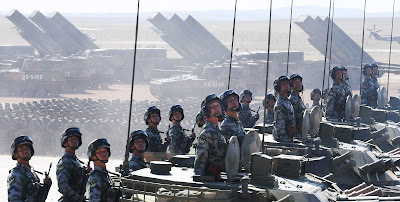 The Guardian News china foreign policy China's Official Communist Newspaper Warns That: "War Is Not Far"
China's Official Communist Newspaper Warns That: "War Is Not Far"
Zero Hedge: China's Official Military Newspaper Warns: "War Is Not Far"
"War is not far from us. Regional situations around China are complex and unstable, and dangers are hiding under the peace. China cannot afford a military failure, so we must be fully aware of potential crisis and be prepared for battle at all times. When the country is on the brink of becoming a great military power, it’s also stepping into a period with high risks to national security," the official People’s Liberation Army (PLA) newspaper wrote according to China's Global Times.